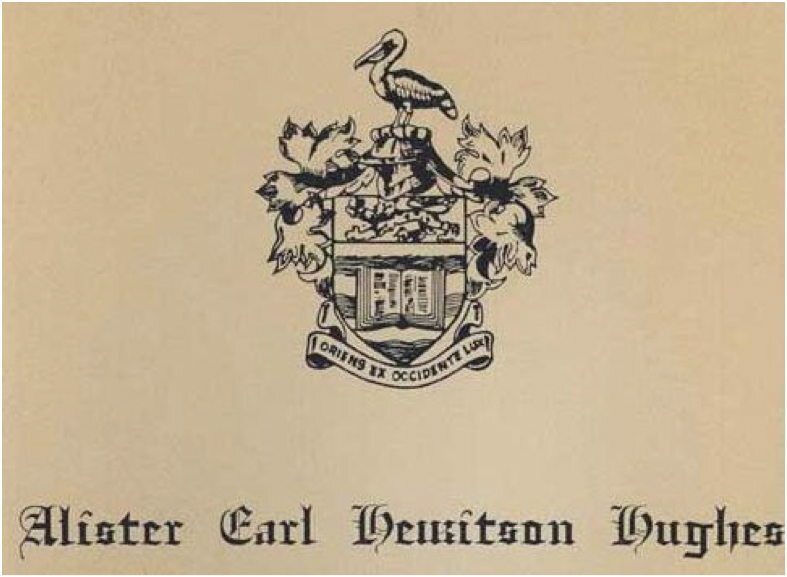 This transcription is the Citation for the presentation to Alister Hughes in November, 1990, of the degree of Doctor of Laws of the University of the West Indies, for Alister’s history of public service in general, and specifically for his courageous journalistic coverage of the birth of the Grenadian nation from 1969 to the time of this presentation. This award was arranged after Alister had declined a knighthood. About this honour from the Universityof the West Indies, he said: "I do not agree with taking Colonial Honours as they scramble our brains. I am very happy to take any honours given me by my own people." CHANCELLOR, there are times, in this Our Caribbean, when to write or speak the truth in public is a dangerous thing; but there are men among us whose business is the truth and who, rather than flee the danger, pursue and proclaim their truth not disguised in learned jargon, but uttered in the common coinage of ordinary language so that all can understand. It is such a man that we honour tonight. 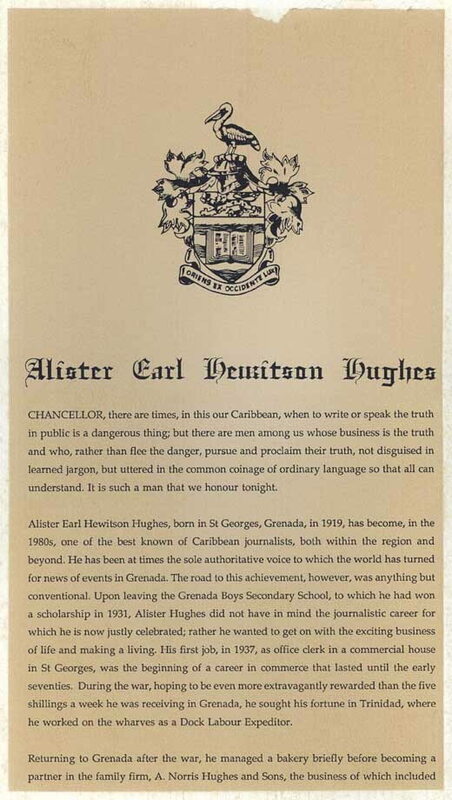 Alister Earl Hewitson Hughes, born in St. Georges, Grenada, in 1919, has become, in the 198Os, one of the best known of Caribbean journalists, both within the region and beyond. He has been at times the sole authoritative voice to which the world has turned for news of events in Grenada. The road to this achievement, however, was anything but conventional. 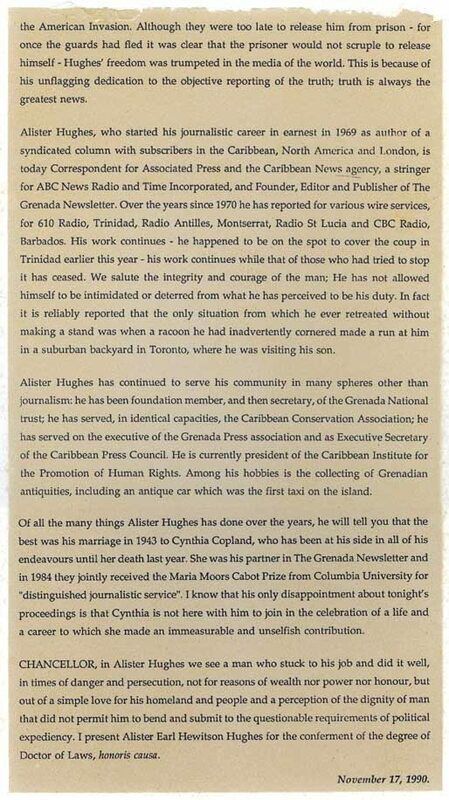 Upon leaving the Grenada Boys Secondary School, to which he had won a scholarship in 1931, Alister Hughes did not have in mind the journalistic career for which he is now justly celebrated; rather he wanted to get on with the exciting business of life and making a living. His first job, in 1937, as office clerk in a commercial house in St. Georges, was the beginning of a career in commerce that lasted until the early seventies. 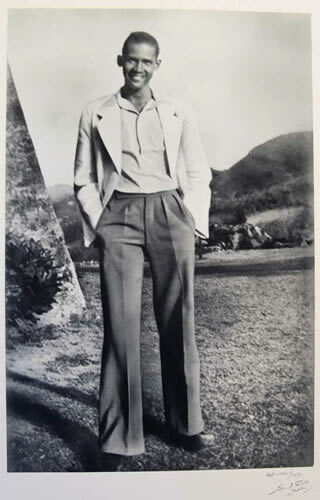 During the war, hoping to be even more extravagantly rewarded than the five shillings a week he was receiving in Grenada, he sought his fortune in Trinidad, where he worked on the wharves as a Dock Labour Expeditor. Returning to Grenada after the war, he managed a bakery briefly before becoming a partner in the family firm, “A. Norris Hughes and Sons,” the business of which included a commission agency, dry goods store, auctioneering, real estate, travel agency, the sale of insurance and the sales and servicing of sewing machines. It is clear that this variety of interests and responsibilities was appropriate to a man with considerable resources of mental energy, curiosity and creativity. He became manager of the family business in 1969, after brief managerial stints in two local manufacturing concerns. Alister Hughes’ skills in the arts of communication were being honed by his numerous activities in so many different spheres of life In Grenada. Apart from his experiences in business, which came to include serving as Secretary, and then President, of the Grenada Chamber of Commerce and Director of the Caribbean Association of Industry and Commerce, he served as an elected member of the St. Georges District Board (1957-60) before being elected to the St. Georges City Council, where he served from 1960-63, including a term as Deputy Mayor in 1962. During the ten years from 1957 to 1967 he was general secretary of the Grenada National Party. There can be few journalists who have had as thorough a knowledge, through personal experience of the spheres of life on which they are called to report. Even the technical side of journalism is represented in his vast experience as Amateur Radio Operator VP2-GE. Hughes was instrumental in providing communications out of St. Lucia after Castries was destroyed by fire in 1948. Again in 1951 he helped provide radio communications within Grenada during a period of civil unrest and rioting. He has the newsman’s instinct to be in the right place when thing are happening, but this is perhaps because he has lived, not the fugitive and cloistered life on the margins that others choose, but rather a life amidst the heat and dust of social and political upheaval. Such a life has as we have said, its dangers, especially when fuelled by Grenada’s peculiarly volatile politics of recent time. Alister Hughes was beaten up by the political thugs of one regime in the seventies and persecuted, arrested, and imprisoned by the army of another in the eighties. The pursuit of truth and the vocation to inform the world about it has always attracted the sinister attentions of those in power who would prefer that the world were not informed of their activities -- regardless of the specific political ideology that has spawned their particular lust for power. 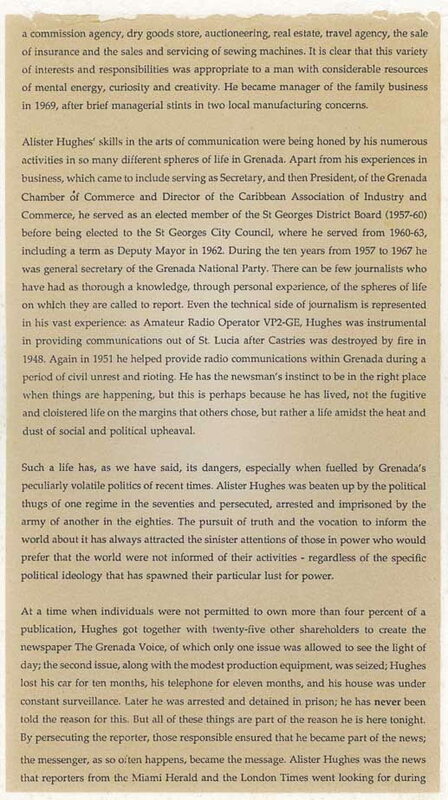 At a time when individuals were not permitted to own more than four percent of a publication, Hughes got together with twenty-five other shareholders to create the newspaper, The Grenada Voice, of which only one issue was allowed to see the light of day; the second issue, along with the modest production equipment, was seized; Hughes lost his car for ten months, his telephone for eleven months, and his house was under constant surveillance. Later he was arrested and detained in prison; he has never been told the reason for this. But all of these things are part of the reason he is here tonight. But in persecuting the reporter, those responsible ensured that he became part of the news; the messenger, as so often happens, became the message. Alister Hughes was the news that the reporters from the Miami Herald and the London Times went looking for during the American Invasion. Although they were too late to release him from prison – for once the guards had fled it was clear that the prisoner would not scruple to release himself -- Hughes' freedom was trumpeted to the media of the world. This is because of his unflagging dedication to the objective reporting of the truth; truth is always the greatest news. Alister Hughes, who started his journalist career in earnest in 1969 as author of a syndicated column with subscribers in the Caribbean, North America and London, is today Correspondent for Associated Press and the Caribbean News agency, a stringer for ABC News Radio, and Time Incorporated, and Founder, Editor and Publisher of The Grenada Newsletter. Over the years since 1970 he has reported for various wire services, for 610 Radio, Trinidad, Radio Antilles, Montserrat, Radio St. Lucia, and CBC Radio, Barbados. His work continues -- he happened to be on the spot to cover the coup in Trinidad earlier this year -- his work continues while that of those who had tried to stop it has ceased. We salute the integrity and courage of the man; He has not allowed himself to be intimidated or deterred from what he has perceived to be his duty. In fact it is reliably reported that the only situation from which he ever retreated without making a stand was when a raccoon he had inadvertently cornered made a run at him in a suburban backyard in Toronto, where he was visiting his son. Of all the many things Alister Hughes has done over the years, he will tell you that the best was his marriage in 1941 to Cynthia Copland, who has been at his side in all of his endeavors until her death last year. She was his partner in The Grenada Newsletter and in 1984 they jointly received the Maria Moors Cabot Prize from Colombia University for "distinguished journalistic service." I know that his only disappointment about tonight’s proceedings is that Cynthia is not here with him to join in this celebration of a life and career to which she made an immeasurable and unselfish contribution. CHANCELLOR, in Alister Hughes we see a man who stuck to his job and did it well, in times of danger and persecution, not for reasons of wealth nor power nor honour, but out of a simple love for his homeland and people and a perception of the dignity of man that did not permit him to bend and submit to the questionable requirements of political expediency. I present Alister Earl Hewitson Hughes for the conferment of the degree of Doctor of Laws, honoris causa.